Ernst Julius Günther Röhm (German pronunciation: [ˈɛɐ̯nst ˈʁøːm]; 28 November 1887 – 1 Julie 1934) wis a German militar officer an early member o the Nazi Pairty. 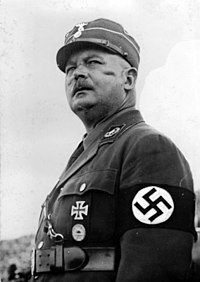 As ane o the members o its predecessor, the German Wirkers' Pairty, he wis a close friend an early ally o Adolf Hitler an a co-foonder o the Sturmabteilung (SA, "Storm Battalion"), the Nazi Pairty's militia, an later wis its commander. By 1934, Hitler haed come tae see him as a potential rival, an he wis executit during the Nicht o the Lang Knifes.